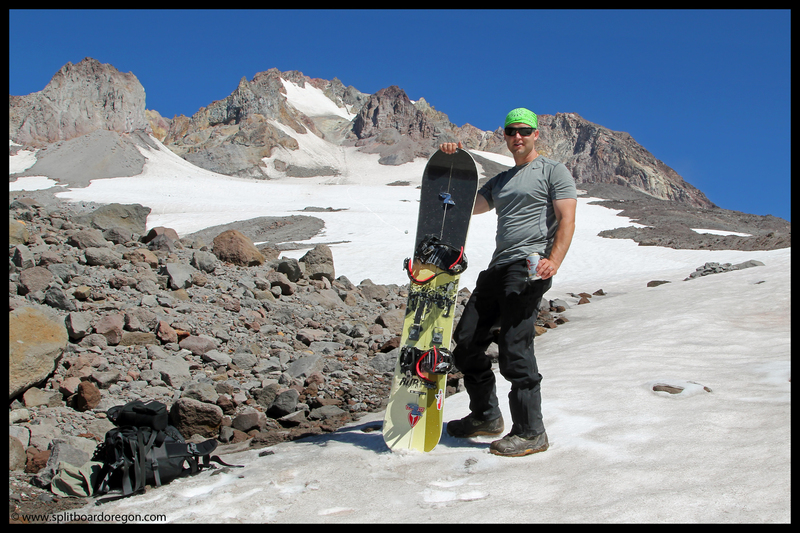 Four thousand five hundred….a number I’d be thinking about in my mind all week after an excellent September ski day on Mt Hood. My morning started early, meeting Dan at the park and ride at the Corvallis exit off Interstate 5 and carpooling north as the sun began to rise over the Oregon cascades. After a few stops, we pulled into the parking lot at Timberline near 8:30 am, shouldered our packs and set out up the Magic Mile canyon shortly after 9:00 am. 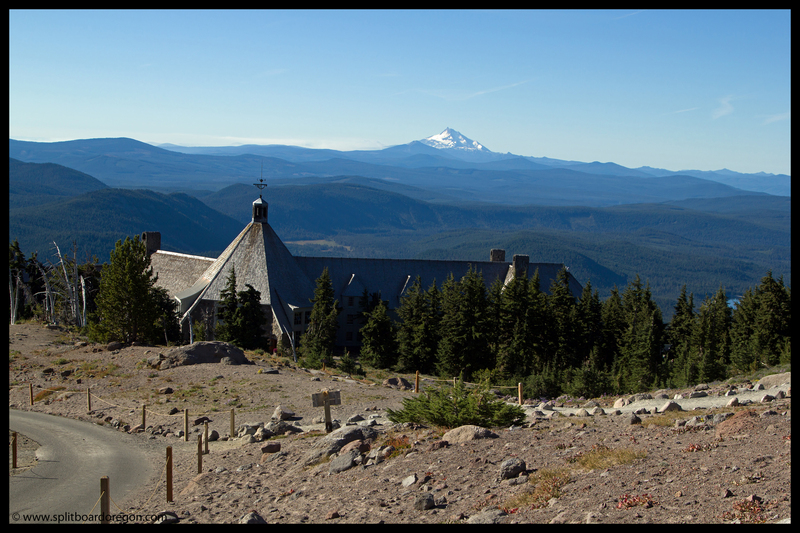 As usual, the views of Timberline Lodge and south towards Mt Jefferson were spectacular. 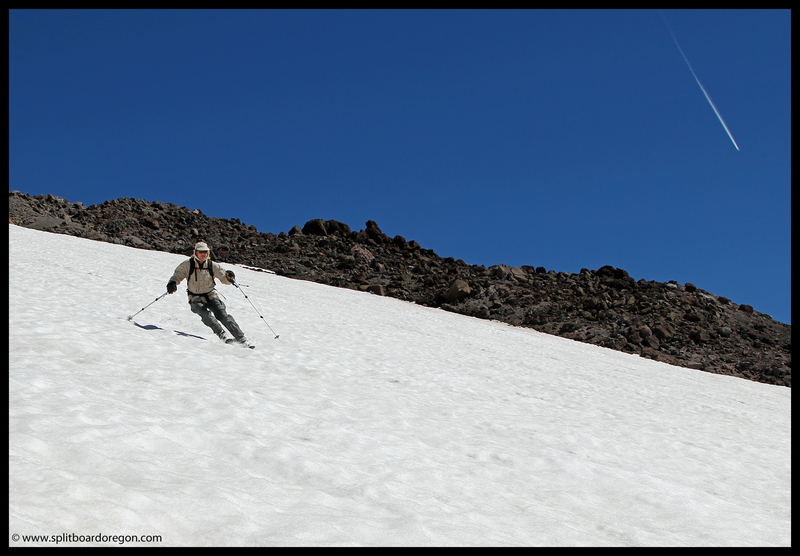 Not wanting to hike under the ski lifts, we headed west towards the Little Zigzag Canyon, finding snow around an elevation of 6800 feet, though it was pretty badly cupped, most likely from previous skier’s whose tracks affected the melting snow. 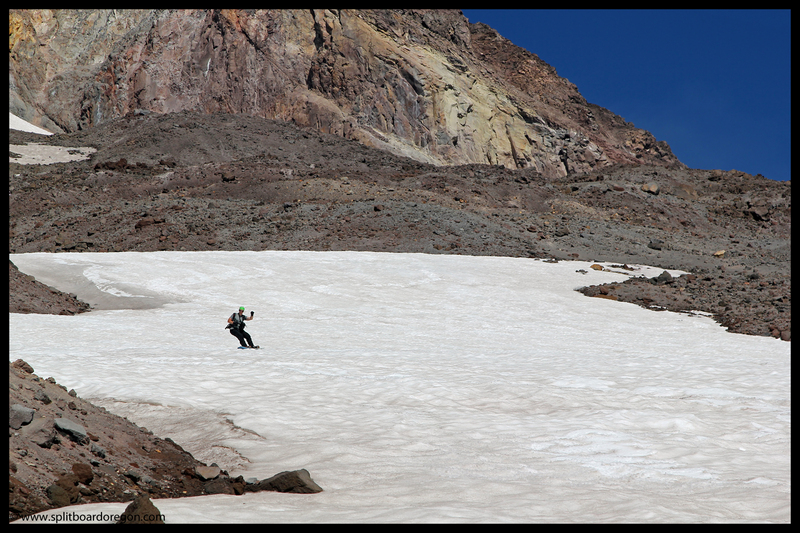 Continuing up the snowfield and onto the Zigzag Glacier, we made good time to Illumination Saddle, arriving at noon. 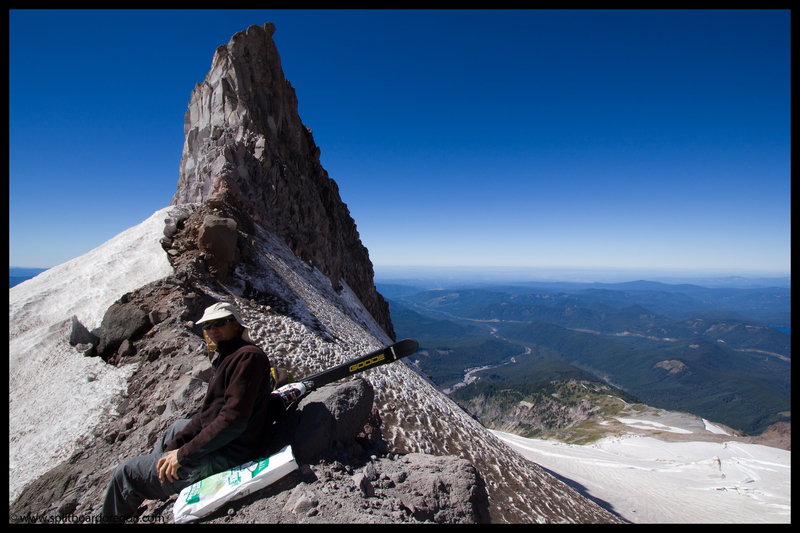 The saddle is always a nice spot to take a lunch break and soak in the views to the west overlooking Illumination Rock and the Reid Glacier. The Reid Glacier is always fairly exposed this time of year, making for some cool picture opportunities of the crevasses and cracks. 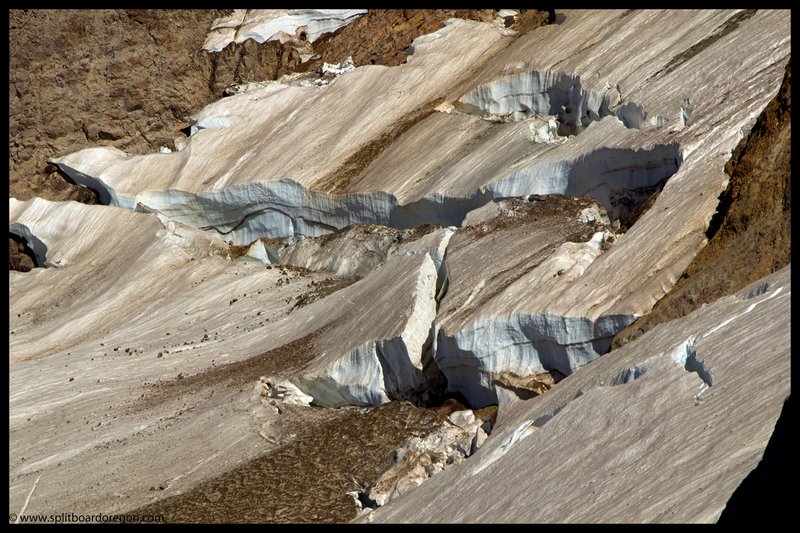 One particular set of crevasses near the top of the glacier caught my eye on this trip…. 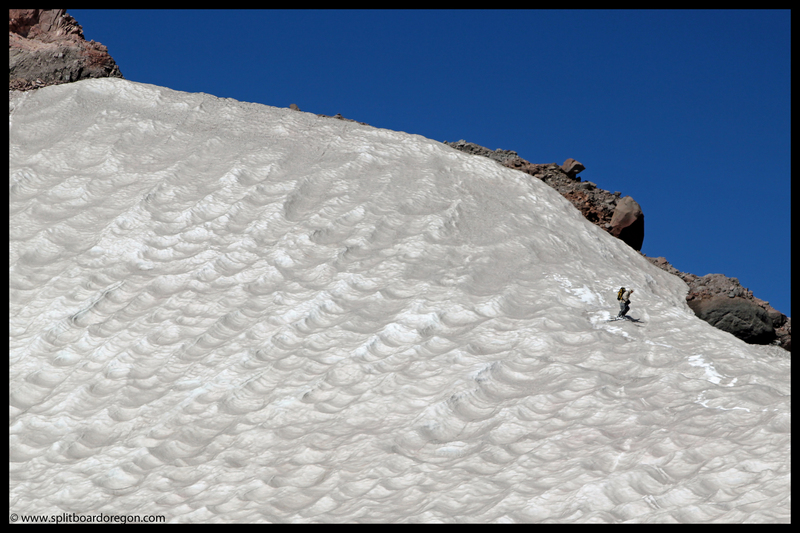 Once on the east side of the Zigzag, we found a nice line which was mostly free of suncups and bumps. Heading down, the turns were pretty nice – not quite as nice as August, but pretty nice nonetheless. 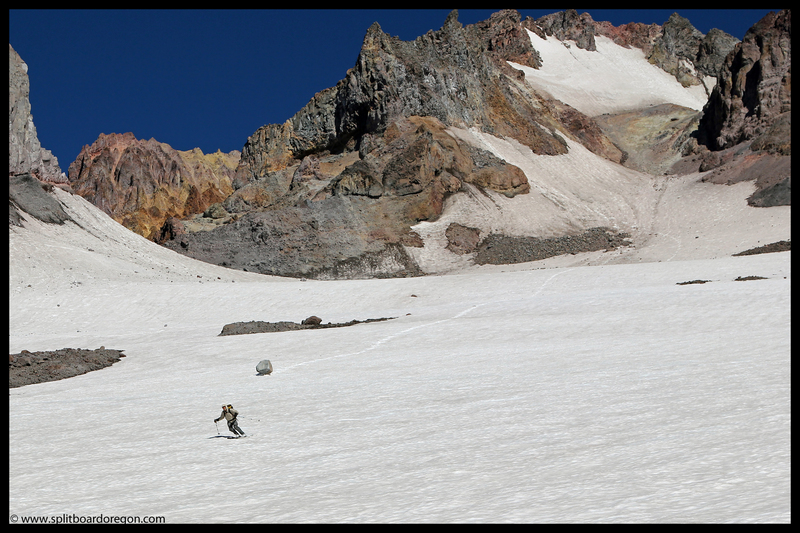 I snapped a few photos of Dan as he headed down towards me with the mountain in the background…..
We continued down the Zigzag to the point where the snow started to become discontinuous a few hundred feet above the Mississippi Head Cliffs. Given the work and effort to get to this point, both Dan and I agreed it was time for a break to enjoy a frosty beverage in the sunshine….. 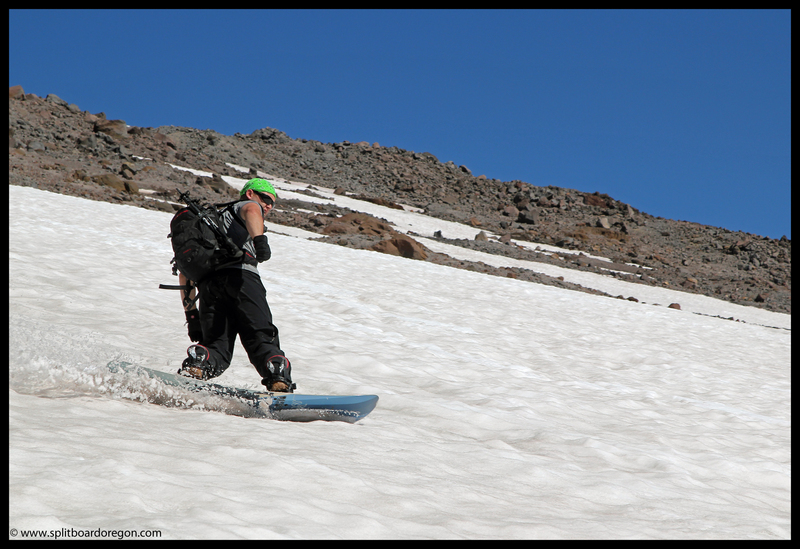 Since the snow on the lower Zigzag snowfield looked iffy at best, we made the decision to descend only a few hundred feet, opting instead to traverse over and climb back up to the top of the Palmer snowfield inside the ski area, which proved to be an excellent decision. Arriving at the top of the Palmer around 3:30, the lifts had shut down for the day and we found ourselves staring down at at nearly 2500 vertical feet of perfect corn snow with not a soul in sight. Both Dan and I strapped in and started down on what proved to be the best snow of the day by far, hooping and hollering the whole way down. After several hundred feet, we felt the need to stop and rest our burning thighs. Continuing down the Mile canyon and beyond, the snow was excellent the whole way down. Sweet turn after sweet turn, we able to descend to within a few hundred yards of the parking lot. Total vertical for the day was right around 4500 feet, by far the most I’ve ever made in September with the assistance of a lift. Sitting at home later that night and reflecting back on a perfect day, I know this trip will rate up there as one of my all time favorite September ski days! Here’s a parting shot from the Mile Canyon…. Thanks Morgan! Yeah, the cups were pretty gnar in a few spots. I totally spaced on thinking you might be interested in September…..if you’re game, we should try to get out for turns in October. I am very game for October turns! No worries, your TAY streak has got me vibin on the TAY as well. I am gonna get out somewhere to keep my streak alive! Sounds good…..let’s see if we can make it work out in October, hopefully for some fresh pow! I dig your guy’s website! I Just started splitboarding last spring and I’m hooked. 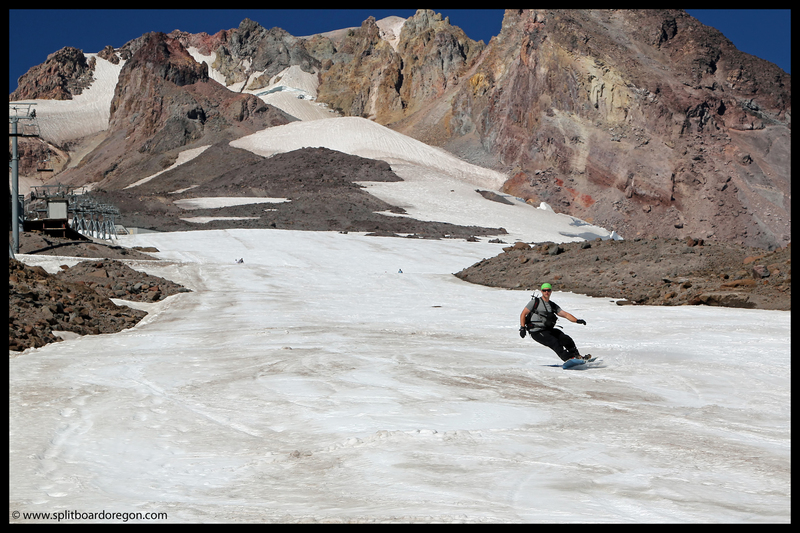 Being an Oregonian myself it’s rad to see there are so many killer spots to get turns year round. My buddy and I actually did the small Hoodoo hike about a week or two after you did, and you were right! 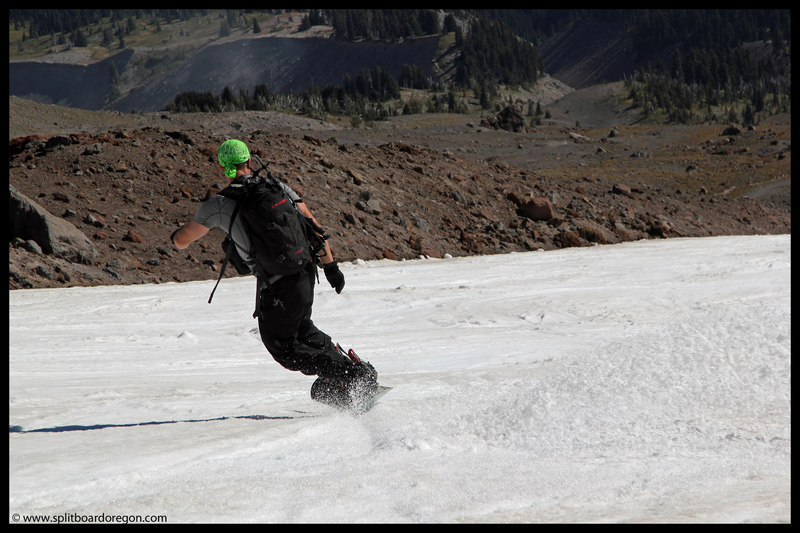 Some killer corn snow turns. Well keep the shred alive and pray for deep snow this winter.